Her story is so surprising it’s not only hard to understand why most people have never heard of her, but it’s somewhat of a challenge to believe it at all. 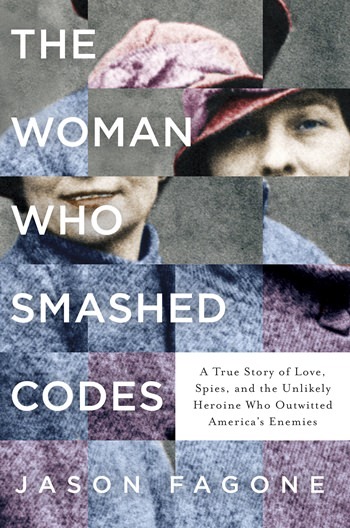 In “The Woman Who Smashed Codes: A True Story of Love, Spies, and the Unlikely Heroine Who Outwitted America’s Enemies,” journalist Jason Fagone recreates a world and a cast of characters so utterly fascinating they will inhabit the psyches of its readers long after the book has been read. Elizebeth Smith, a Quaker girl from a small town in Indiana, first fought against societal norms by earning a college degree against her father’s will. When she was 23, she railed against a presumed lifetime of teaching, followed by marriage and children and headed to Chicago. Through happenstance, she met George Fabyan, a wealthy and eccentric businessman who owned a compound named Riverbank. There, scientists, inventors and intellectuals holed up to study and learn, experiment and discover — all funded by Fabyan’s inherited fortune. Fabyan hired Smith as his assistant. “Will you come to Riverbank and spend the night with me,” he asked upon first meeting her. Stunned and confused, yet intrigued, Smith agreed. It was 1916. During her four years at Riverbank, Smith met and married William Friedman. Initially, they were assigned to seeking encoded messages that Francis Bacon supposedly embedded in the works of William Shakespeare. Their work quickly expanded when they learned they had unprecedented and unmatched codebreaking skills. Fagone chronicles the couple’s lives and accomplishments against the backdrop of the birth and growth of the modern intelligence community. His research is exhaustive and his storytelling, spellbinding.